Yesterday there I am going through my worker-drone work day when all of a sudden, excitement!!! I looked up from my desk and I saw this huge ship. I jumped up. "That is the biggest ship I have ever seen in my life!" I exclaimed. My coworker Susan Martin jumped up too. She is our style and fashion editor! She knows style when she sees it and this ship had style. "Do you have your camera?" she said. I also got my glasses so I could read the name of the ship. It is the Herbert C. Jackson! Remember when we were visited by the Adam E. Cornelius and how thrilling that was? The Herbert C. Jackson is bigger. That is a picture of the Herbert C. Jackson up above unloading grain in Buffalo. 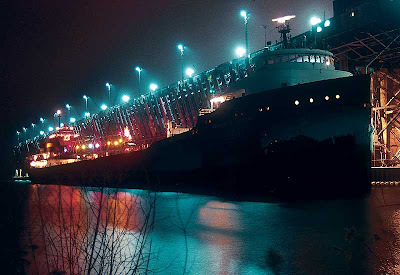 There is this wonderful site called www.boatnerd.com that gives you pictures and statistics of all kinds of freighters which, I do not know why I like these freighters but I do. I told our business editor, Grove Potter, to pull strings so I can take a tour of one of them. Perhaps they will let me ride on one of them too! Perhaps I can sail to Duluth. I have a review of a recital Leonard Pennario gave in Duluth, did I mention that? The Duluth Library sent it to me. The review said that Pennario was a favorite of Duluthians. I wonder if the Herbert C. Jackson sails to Duluth. Wait! It does! 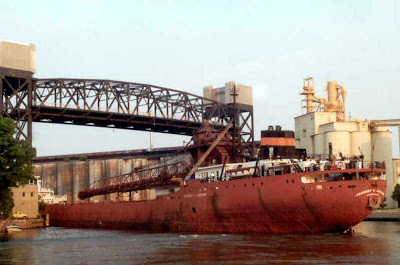 Here is a picture of the ship in Duluth that I found on www.boatnerd.com. This site is great. They list all these ships and apparently what happens is boat nerds, like me I guess, snap pictures of these ships when they see them and send them in. So you can see the Herbert C. Jackson, which I now learn was first launched in 1959, in about 100 different locations. It is like Howard and his smoking chair! Well, almost. Here is a shot someone posted of the ship in Buffalo with our grain elevators. 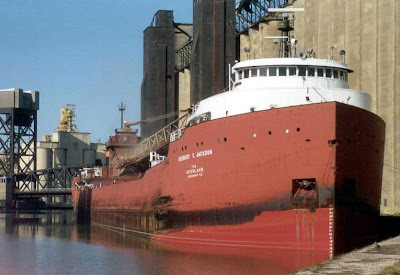 Here is the Herbert C. Jackson in Milwaukee. A beautiful night shot! Hereafter when we hear the name Jackson we will not think of him! We will think rather of the Herbert C. Jackson. Here is the beautiful and historic shot I took of the ship from our office window. Click on the pic and you can see the ship better. By the time I was able to run out of the office and outside the Herbert C. Jackson was heading out to sea. It was being guided by a tugboat. Another picture which shows our marvelous sky. Here is the Herbert C. Jackson leaving Buffalo and sailing farther and farther away. Goodbye, Herbert C. Jackson! Godspeed! The ship gives Buffalo a smoke signal as a farewell salute. But today after the visit of the Herbert C. Jackson, Buffalo feels a little different. The ship brought magic with it!